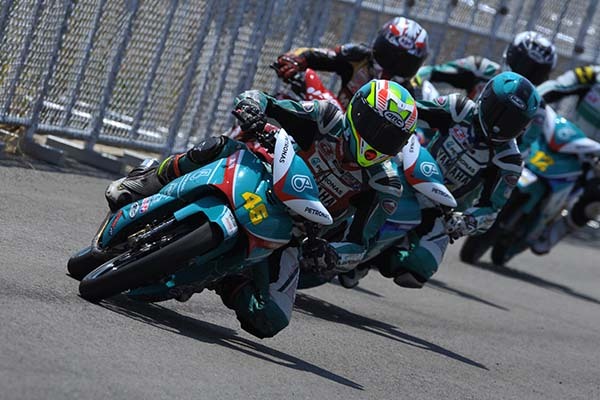 Team PETRONAS Yamaha Maju looks set to be making a strong comeback in the 2015 PETRONAS AAM Malaysian Cub Prix Championship, if the timed practice results from Round 1 at Temerloh, Pahang on March 14, is anything to go by. The riders from the team grabbed three out of the top six results in the premiere CP130 class. Ahmad Fazli Sham and Taufiq Roslan checked in second and third fastest with lap times of 44.846s and 44.996s respectively, only 0.10seconds behind the fastest rider, Mohd Zamri Baba. At the same time, their team mate Abdul Muhaimin Roslan clocked fifth fastest with 45.160s. In the CP115 class, Tengku Amirul Haffiruddin of team Motul Yamaha YY Pang was second fastest in his class with 45.430s followed by third placed Kasma Daniel Kasmayudin (PETRONAS Yamaha Maju) with 45.826s.